Just buy 1 bottle of MILO® Nutri-G in any participating 7-Eleven outlets during the contest period and write your full name and myKad number on the front part of the receipt. Take a picture of the receipt and send via Whatsapp to 014-9823695 to participate and stand a chance to win. 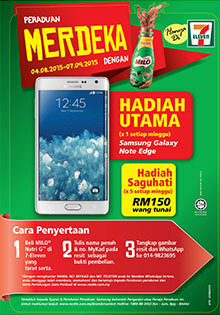 Visit Peraduan Merdeka Dengan Milo Nutri G Hanya Di 7-Eleven Contest rules & regulations for more details.